Help children experience the wonder and love of God in this timeless resource for all catechetical and liturgical leaders. Since 1973, Hi God! has been helping generations of youngsters discover God's love through song, gesture and prayer. It is a timeless resource for all catechetical and liturgical leaders helping children experience the wonder and love of God through their expression of devotion to Him. This guitar accompaniment features chords and vocal parts for the music album Hi God! by Carey Landry and Carol Jean Kinghorn. This 26-song CD was originally released in 1973 by Carey Landry and Carol Jean Kinghorn as a resource for all catechetical and liturgical leaders helping children experience God. 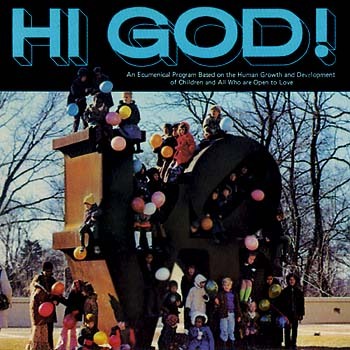 This 26-song MP3 album was originally released in 1973 by Carey Landry and Carol Jean Kinghorn as a resource for all catechetical and liturgical leaders helping children experience God. Since 1973, Hi God! has been helping generations of youngsters discover God's loving presence and kindness through song, gesture and prayer. The message remains the same today. It is a timeless resource for all catechetical and liturgical leaders helping children experience the wonder and love of God through their expression of devotion to Him. All the songs are appropriate for liturgies with children, and most are not limited at all by age levels. Offering songs for various liturgical moments, like the opening rite, preparation of gifts and Communion, Hi God! is a great resource for getting children to participate more fully at Mass. There are also a variety of songs for special seasons and feasts of the year that will create wonderful memories for children as they sing them year after year.